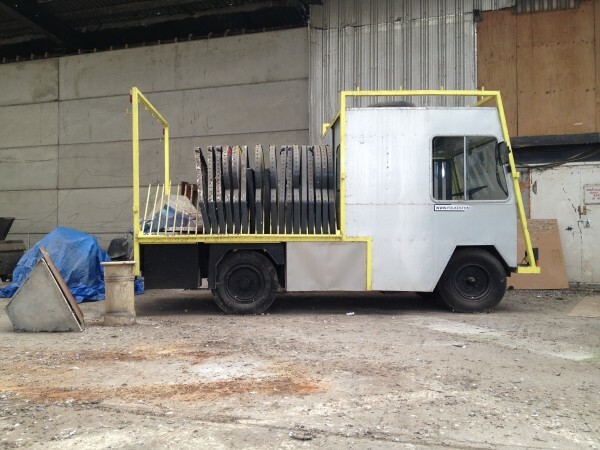 A big THANK YOU to the Creative Foundation for lending the Folkestonmy Float to us on a long term basis to start roamig in Hackney Wick, East London. I went down to Folkestone on a sunny Friday afternoon before Easter and met the Robert, Jo and Dan from the Creative Foundation to sound out if a loan was possible and inspect the float. It brought back happy memories of 2008 when the Float was originally used as a roaming mapping device for FOLKESONTOMY, public works' contribution to the first Folkestone Triennial. Back then it was transformed to have a larger cabin and a bright yellow frame to hang lots of signs on. It was a bit like seeing an old friend again, slightly dusty but still intact. Milk Floats - especially their batteries - are sensitive things (as we found out in 2008) and if not used regularly they are quite hard to get going again. On this occasion it meant we couldn't go for a celebratory reunion drive around the harbour. None the less the long term loan and the support from the Creative Foundation is the perfect start to Wick on Wheels. The float will now travel back to CBL Electric Vehicles in Oxfordshire where we bought it for a full check up before being delivered to Hackney Wick. The maiden voyage will have to wait a little longer ... unfortunately without a celebratory sending off from Folkestone.